Miriam’s father, and Darlin’s grandfather, is delighted at the reunification of mother and daughter on Tuesday night. As a consequence of the ‘zero tolerance’ policy, more than 2,300 children have been separated from their parents. This is one of the stories we tracked down thanks to ProPublica's project in partnership with other media outlets, which allows family members to track down loved ones. — Child detained in shelter: Darlin Mariela Martínez Pérez (5 years old). — Detained mother: Miriam del Carmen Martínez Pérez. — Country of origin: El Salvador. — Date and place of detention: McAllen (Texas), May 18 th, 2018. — Who is looking for them: The father and grandparent (Manuel). — Child location (approximate): Arizona. — Detention Center where adult is detained: Southwest Key, in Houston (Texas). — Have they communicated? : Manuel has communicated with Miriam (the mother) often, and with Darlin (the girl) only once. Hours after this story was published, mother and daughter were released from their detention center and shelter and are now reunited with their family in the US. “The girl thinks her mother abandoned her. She doesn’t understand what is really happening," Manuel, the father of the detained mother, told Univision. "And the truth is that my daughter’s child was taken away using lies. It was deception, a kidnapping. My daughter tells me she was put with two other women in the detention center and their children were taken away. She was told that the girl was dirty, that they were going to bathe her ... and then they never brought her back”. 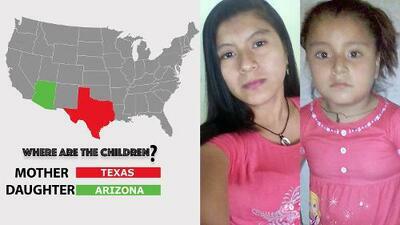 Manuel is the father of 22-year-old Miriam Martínez, who entered the US with Darlin Mariela, her 5-year-old daughter. He wished to withhold his real name, because he is undocumented. He lives in Florida with his partner, also from El Salvador. “Why don’t you bring me the girl back?”, Miriam asked the authorities at the Southwest Key Detention Center in Texas. “'Because we have many and we aren’t done bathing them'”, she says they replied. But four hours later she knew she wouldn't see her anymore. Manuel says Miriam told him she “started to cry and then the guards made fun of her because she cried a lot. They didn’t give her any reason, they didn’t say anything”. The three women in detention spent the whole night not knowing anything about their children. The next day they told Miriam the girl was in a shelter in Arizona. Manuel speaks frequently with his daughter, because he topped up her cell phone credit, but things are different with the girl. Only once did the social worker put her on the phone, “but she is very young, she did not speak, she just started crying”. The same thing happened once when the mother tried to communicate with her daughter. “She doesn’t talk, she just cries”. The grandfather and his wife unsuccessfully tried to obtain guardianship of the girl. They filed application papers, but they never heard about the case again. “This is very unfair. It’s not the law, it’s something else. It’s cruel for those who don’t have access and don’t have papers ... we are all human and we all feel the same”. Now, Miriam must prove “credible fear” to an immigration judge so that she can proceed with her asylum request. Manuel prays that the judge believes her history of domestic violence and how she fears for her life if she returns to El Salvador. She has been pressured into signing a voluntary deportation authorization form, but returning to El Salvador is not an option. “My daughter’s problem is that in El Salvador there is a man, who is not the father of the girl, who is in the shelter because her biological father wouldn’t take care of her. This man is not just any man, he’s a bad person, a gang member and he wanted to force my daughter to be with him. When she refused, he broke into her house with a gun, beat up Miriam’s mother, and then grabbed Miriam by the neck and threatened to kill her. He stole some things and then kept threatening her ... she had to leave, she can’t be there”. While he speaks almost daily with his daughter in detention, Manuel thinks of the girl. “I think of what we give our children. We feed them and give them the love they need, but they are there alone, with people they don’t know. And then we don’t know if those people care enough for our children”.